Hydrogen peroxide has been shown to cause damage to the heart, lungs, arteries and veins upon ingestion. Hydrogen peroxide is used in food production to sterilize lines, including those carrying various foods and food ingredients. For example, lines which carry milk, processing vessels, and milk jugs are sterilized prior to filling to kill bacteria and prevent contamination of the fresh milk. Although hydrogen peroxide is not supposed to reach the consumer, sometimes the milk can arrive contaminated. While the concentrations in milk are not likely to be fatal, the possiblity of side effects still exists, and milk should be checked to ensure that it is safe to consume. This is particularly important since milk is a common drink for babies and small children. ChemSee Foods now provides simple, disposable, detection strips for the detection of hydrogen peroxide in milk. The ChemSee Foods’ Detector for Peroxide will quickly indicate if your milk is contaminated. The Peroxide Detector can also be used to detect if Peroxide has been used in many other foods, however, adulterated milk is the most common use. 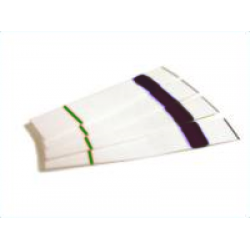 The ChemSee Foods’ Peroxide Detection Strips are also available for testing of other foods and liquids.